Some layout changes on the user interface was done. A sale can now be moved from one table to another. The waiter that was allocated to a sale/table can be changed. In Version 3.8, only new items added to a sale are printed on the various department printers (kitchen/bar/etc). In previous versions, each department would have receive items for that department but all items would have been printed again if a new item was added. There is now a 'Resubmit Full Order' option to reprint the full order slip with all items for that order. It is now possible to allocate multiple printers to a Department. The order slip will be printed on all the printers for a department. When upgrading to version 3.8, you will need to set up your Department Printers again. Previously this was done in the Departments Menu in ROBOTILL Manager. 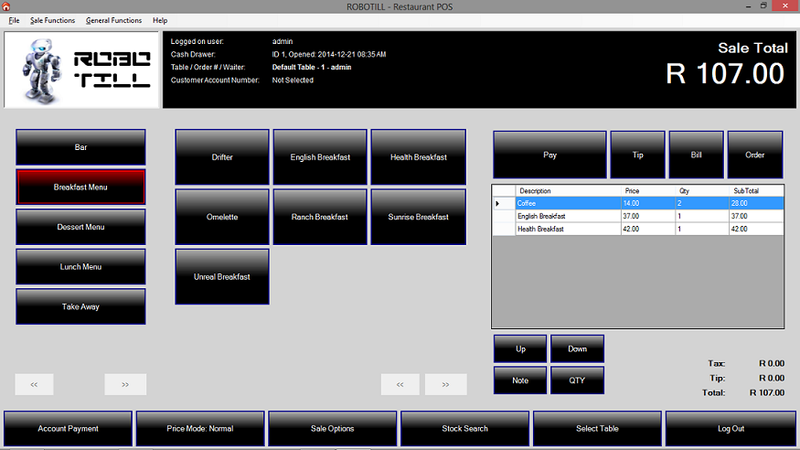 This is now done in 'Department Printers' under Main Setup in ROBOTILL Manager.